Summer time is almost upon us and with it comes the excessive hot weather. This weather pattern is the heart’s most difficult to cope with, according to TCM. Blood heats up and so does blood pressure, causing mental and physical fatigue, emotional distress, dizziness, palpitations, shortness of breath, angina and cardiac problems. To relieve any of these symptoms in the coming months, as well as a general lack of vitality, restlessness and absentmindedness due to summer heat, try the following simple massage to strengthen the heart. Start at H 1 (ji quan) and move in one direction to the end. Use your fingers, thumb or palm to apply gentle pressure along the entire meridian. Remember to massage meridians on both sides of the body. 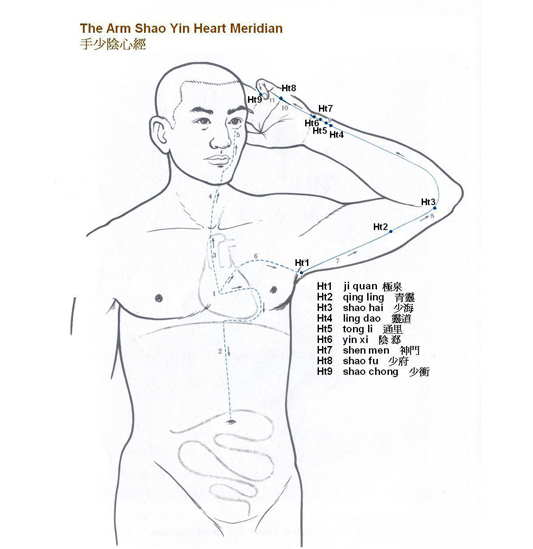 When you reach the end, return to H 7 (shen men) massaging and circling 36 times with thumb and finger. This point is beneficial for emotional issues, anxiety, mania, insomnia, heart palpitations and angina.